Conifer Canine is Your Dog Training Resource! Click on a skill to be taken to a page with more information pertaining to that skill. Personal Protection Dog Training: Real. Advanced. Training. Police Dog Training: relevant, high-performance training. Detection Dog Training: bomb dogs, drug dogs, cancer detection, cell phones, ammo, contraband food, etc. Security Dog Training: for top-notch options where real-time security is needed. Conifer Canine offers professional dog training in both Basic and Advanced dog obedience, police dogs, bomb detection dogs, drug dog training by Conifer Canine as well as German Shepherds for Sale. We operate a successful and proven School for Dog Trainers, where trainers are trained! We train to a high level, have superior customer service, employ certified trainers, and utilize advanced and up-to-date training methods. Our client evaluations reveal a 99% satisfaction rate! We are located near Spencer, Indiana near Indianapolis, Terre Haute, Martinsville and Greencastle, We serve Indiana, the Midwest, and the nation. Our training has even reached worldwide proportions. We train family pets as well as working dogs. If the dog is to truly be man’s best friend, then dog and man must have a relationship through reliable obedience and performance. Much of what is seen on TV and the internet adds to the confusion and misinformation about a stable relationship between man and canine. We’re here to help! We have some exciting options in dog training. Our trainers are certified in their field/s of study; specialists, not backyard hobbyists. Training since 1992, we have the experience and knowledge needed to provide solid training for your dog. Each dog is given individual attention and each client is given sufficient time to get their questions answered. A trainer willing to spend time with the client is a rare jewel, indeed. From basic to advanced obedience training, guard dog training and Police dog training to narcotic dogs, bomb detection dogs and cadaver dogs, as well as dog training courses for those desiring to become trainers themselves, our Dog Trainer College. We’re sure to have something for just about everyone interested in dog training. We offer dog-related seminars for pet owners or professionals who want to know more about their dog/s. Conifer Canine has a beautiful location near Spencer, Indiana – within easy driving distance of Indianapolis, Terre Haute, Martinsville and Bloomington, and beyond. We can easily service Indiana, Illinois, and Kentucky. Due to the professional quality and the variety of services we offer, many clients travel from even farther distances. Our wooded acreage is conducive to raising sound working prospects and training dependable dogs. We have trained many breeds of dogs since beginning in 1992 and have bred/trained German Shepherds since then as well. 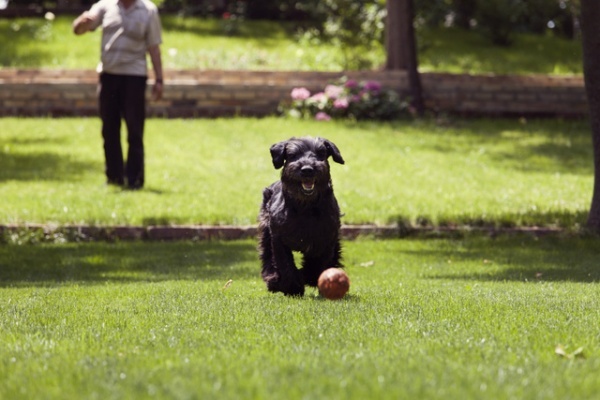 For a dog to be a well-rounded member of the family, quality dog training and proper socialization is a must. Our experience with many different types of dogs in several different training venues has given us a solid training strategy and the skills necessary to accomplish training goals. All of our trainers are certified by quality dog trainer schools (some by our own Dog Trainer College), ranging from obedience trainer to Master Trainer! Our interest in working dogs evolved from a desire for security but also wanting a partnership with a dog that has a demanding job to do. The basset hound lazily lying on the front porch has its attraction, no doubt. However, our passion is working side by side with a dog that is properly and knowledgeably trained and seeing him perform his assignment to his maximum potential! Nothing compares with working a dog that possesses a stable temperament, steady nerves, and an overwhelming desire to work for his/her human. Our dogs are more than pets, more than “stock;” they are family. 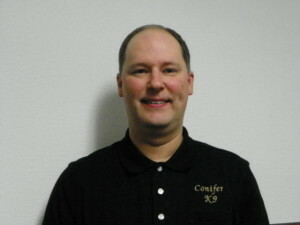 Tim Miller is the Training Director at Conifer Canine. Tim has trained hundreds of dogs since 1992. Desiring to be more than a backyard hobbyist, Tim received Certification (from Highland Canine, NC) and is a member of the American Police Canine Association and the Association of Professional Dog Trainers. He has the experience desired by our clients, who have learned to value his input and expert advice. He has taught extensively in a public setting, including dog training seminars and Conifer Canine’s school where trainers are trained, the Dog Trainer College. Tim frequently takes refresher courses on subjects relating to training thereby maintaining relevancy and competency. Contact us today with your training needs and/or to set up an appointment. All training and visits are by appointment only. All appointments are on Eastern Time. Our certified trainers are here to assist you and improve the quality of life between you and your dog.